Washington’s roads are once again on par for a record. This morning, I spoke to Lowell Porter, director of the Washington Traffic Safety Commission, who told me that there were 483 traffic deaths in the state in 2009. That’s still 483 too many, Porter points out. And the finding isn’t yet official. But the 2008 total — 522 — is still much higher. And that number is below the number of traffic deaths that occurred in the state in 1955. Porter says that the state is meeting its expectations — 25 less traffic deaths per year — in an effort to get to “Target Zero,” or no fatalities, by 2030. Dateline NBC will soon shine a spotlight on one of Bremerton’s most notorious murders. The news show came to Kitsap for a retrospective look at the killing — and subsequent cover up — of Dawn Hacheney in 1997. Sue Shultz, Bainbridge police lieutenant who investigated the murder, said that she gave an hour and a half interview to Dateline at her island office earlier this month. Others involved in the investigation also gave interviews, I’m told. I also got an email from Gregg Olsen, an Olalla author whose new yet to be released book “A Twisted Faith,” chronicles the killing and investigation of Dawn Hackeney’s killer, her husband Nick. Gregg sent me a few photographs from his interview with Dateline, which you can see on the right (Gregg is at the left in the photo). Nick Hackeney is currently serving a more than 26 year sentence in prison for the murder. 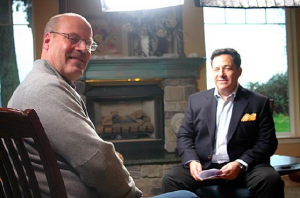 I’ve not yet heard when Dateline plans to run the Kitsap segment. 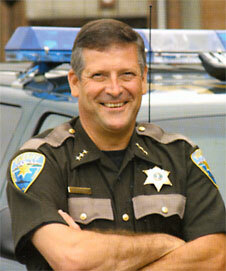 Climbing ladders has been disastrous for Kitsap County Sheriff Steve Boyer these past few years. Just after Christmas, Boyer, whom I saw yesterday during a visit by Washington State Attorney General Rob McKenna, was packing up decorations in a garage attic. The ladder gave way, and he fell, breaking his foot and leaving him badly bumped and bruised. An injury like that couldn’t keep the sheriff away from work for long, however. He’s currently keeping weight off his foot with a wheeled device that he can prop up his knee on. In October 2007, the sheriff also had a bad fall off a ladder while cleaning his gutters, in which he sustained a broken pelvis. He was in good spirits Thursday, accompanying McKenna to meet with West Sound Narcotics Enforcement Team detectives, emergency management and 911 dispatching employees, state troopers, the Silverdale Rotary Club and the Kitsap Sun’s editorial board. Remember a Bremerton attorney’s quest to get a Bremerton parking ordinance tossed? Well, the effort has died. Washington State Supreme Court Commissioner Steven Goff denied attorney Thomas Weaver’s appeal of a $45 parking ticket late last year. Weaver had hoped to argue before the state’s supreme court that Bremerton’s ordinance about citing drivers who are parked on city streets with expired tabs is unlawful. He based his argument on the idea that state law “preempts” the ordinance by making it illegal to drive with expired tabs, but not to be parked with them. Bremerton’s ordinance takes the law a step further. As a quick side note, I actually had a chance to talk with Goff, who reviews cases and can deny them from being heard before the state supreme court. His position, a filter of sorts, is not well known. Goff serves at the behest of the court, whom he not only can recommend cases to, but as in Weaver’s case, can deny them as well. He also has a staff of attorneys to help him. The commissioner, in short, helps ease the burden of the caseload the court reviews. A noteworthy legal issue emerged this week during the Kitsap County Superior Court trial of a Bremerton man accused of unlawfully possessing a firearm. A man watching the trial in the courtroom wore a T-shirt that said something to the effect of “Jury Nullification is Constitutional.” Deputy Prosecutor Giovanna Mosca pointed the shirt out to Judge Sally Olsen, who took quick action. She asked the man, who had previously been wearing a coat covering the shirt, if he would put the jacket back on. He obliged. Olsen also made certain that the jury, which wasn’t in the courtroom when the man took off his jacket, had not seen the message. On the advice of Mosca, she called one juror in the courtroom to determine if he had come into contact with “anyone in the front row,” without specifically identifying the man. The juror said he had not. But why did Olsen go to all that trouble over a shirt? First, here’s a little background on the case: Luke T. Groves was ultimately convicted of two counts of unlawful possession of a firearm. His gun ownership rights were revoked in 1990, when he was convicted of a felony for breaking into a Shelton school. He claimed that he was never informed that his gun-ownership rights were revoked for life and he argued that he wasn’t in possession of the guns, since they belong to his wife. The prosecution’s case was straightforward; police found a rifle and pistol in Groves’ Hewitt Avenue home and he is a convicted felon, making him in violation of the law. But there were many issues the jury was not allowed to consider in the case, notably the question of whether he was ever told that felons aren’t allowed to have guns. Groves’ defense attorney also was limited in her ability to argue the question of who “possessed” the guns. In a roundabout way, those limitations and the instructions given to the jury in the Groves trial were behind the jury nullification t-shirt controversy. Jury nullification is basically the idea that jurors can choose to disregard the law and acquit a defendant if they feel the law — or the way it’s being applied — is wrong. And what about the man’s right to wear such a shirt in court? For the answer, I drew on the expertise of Stewart Jay, a University of Washington law professor who specializes in constitutional law. Put simply, Judge Olsen’s duty to ensure a fair trial overrides the man’s First Amendment right to express himself by wearing the T-shirt. Jay cites several examples of ways in which such speech is curbed: Campaigners aren’t allowed near polling stations for fear of intimidating voters, and the classic example of yelling “Fire!” in a crowded theater. “A judge is always concerned with any attempt by a member of audience to influence a member of the jury,” he said.